Zambezi River is the fourth longest river in Africa with a length of 2,200 miles. It is also the longest east flowing river in Africa. It originates in the wetlands of the Mwinilunga District of north-western Zambia. The first European to see this river was Vasco da Gama in 1498. He called it the River of good omens. This river is home to the Kariba Dam which is a huge source of hydroelectric power. This dam is 420 feet high and 1,900 feet long. It flows through six different countries including Zambia, Angola, Namibia, Botswana, Zimbabwe, and Mozambique. The Zambezi River has a few bridges including Otto Beit Bridge, Victoria Falls Bridge, Katima Mulilo Bridge and Tete Suspension Bridge. There are several famous waterfalls along this river. It is also home to the amazing Victoria Falls. Other waterfalls are Ngonye Falls in Western Zambia and Chavuma Falls on the border of Angola and Zambia. The Zambezi River has been described as having the head of a fish and the body of a snake by the local Tsonga people. They believe the river is protected by the Nyami Nyami, the guardian God of the river. The upper section of this river used to flow through the Makgadikgadi pans in Botswana. The middle course of the river is well known for the two man-made lakes which are Kariba and Cahora Bassa. Water pollution is a major issue in the river due to raw sewage. Just upstream of Lake Kariba the river valley widens and it is contained by a steep slope which is nearly 2,000 feet high. Hippos, Crocodiles, Elephants, Black Rhino, Lions, Zebra, Buffalo and Giraffes are some of the larger wildlife that can be found around the riverine woodlands of the Zambezi river. The river floods every year and the locals call this event “Kuomboka” translated this means “move out of the water”. Tourists from all over the world come to see the annual flooding. Rafting is very popular with tourists due to the Zambezi river rapids. Declan, Tobin. " 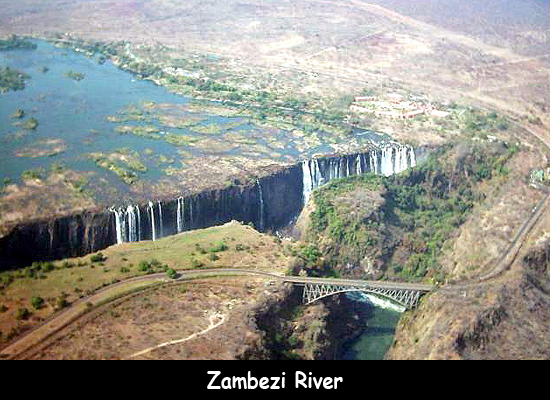 All Facts for Kids about Zambezi River ." Easy Science for Kids, Apr 2019. Web. 26 Apr 2019. < https://easyscienceforkids.com/zambezi-river/ >.